Bengalis celebrate the Bengali new year with great pomp and enthusiasm. They offer puja to lord Ganesha and goddess Laxmi for the welfare of the families. Ladies wear traditional sari and men wear dhoti kurtas. The day is celebrated with immense merriment and grand feasting. 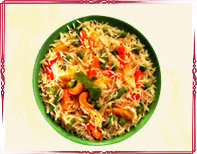 Variety of delicious recipes are prepared at home and sweets are distributed among friends and relatives. This day is considered as auspicious to start new ventures and business. People also exchange gifts on this occasion to make the celebration even more grand. Availing the services of GiftstoIndia24x7.com you can Send Gifts to India to your dear ones wherever they are settled. This online store arranges plethora of gift articles for you to send as gifts. 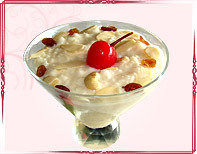 The site offers variety of delicious traditional sweets, chocolates and dry fruits. You can always send these items as Bengali New Year Gifts to make this occasion more charming and joyous. These gifts will be delivered in beautiful boxes or trays decorated with colorful papers and motifs to give them a festive look. People prepare various mouth-watering dishes to celebrate a grand feasting. 1. Wash the rice well. Dry it for 1 hour by spreading out on a sheet under a fan. Once dried, mix 1 tbspn oil, 1/2 tspn ghee, green chilies, turmeric powder and salt. 2. Heat 1 tbspn of oil. Add raisins, bay leaves, cloves, cinnamon stick and cardamom. Let it splutter. Add rice. Stir for a 3-4 minutes till the rice becomes opaque and you can smell the aroma. Add peas. Stir for a minute. 3. Add 3.5 cups of water, cover and cook on low flame. Check rice in 15 minutes. Keep checking. Use a fork to stir the rice so that the grains don't break or get mushed. Add Sugar. Taste and adjust salt and sugar if necessary according to your own taste. If necessary may add a splash of water if it is too dry. Also, stop cooking when the rice is 99% done. Keep covering it and it will get cooked in the vapour. 4. 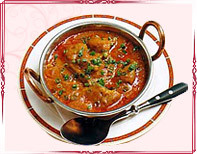 Serve with vegetable curry. Potatoes - 12-14 small & round ones. I generally use the 1 kg packet of potatoes. 1. Bring water to a boil with little salt and parboil the potatoes. Peel the potatoes and keep them whole. 2. Heat oil and fry the potatoes adding a pinch of turmeric powder, cayenne pepper & salt. Saute the potatoes till they are light golden. Keep aside. 3. In the same oil, add the bay leaves, green cardamoms, cinnamon stick, cloves and Asafoetida and cook for a few minutes. 4. Add the onion paste and fry until oil separates. Now add the ginger/garlic paste and fry until oil separates. 5.Add the tomato puree and cook till nicely blended with the onion-garlic-ginger paste. 6. Add the turmeric powder, cayenne pepper, kashmiri mirch, garam masala powder, salt, sugar and lemon juice and blend the spices and onion-ginger-garlic paste well and cover and let it simmer on low heat until the masala-mix is cooked (takes about 10 min). 7. Now add the potatoes, red button onions and the 2 green chilies and mix everything well with the masala. Cover and let it simmer on low/medium heat for another 10 min. 8. Add a little water and give it another good stir and pressure cook until it gives way to a moist gravy and the potatoes are cooked. The gravy should not be too liquid or too thick. It should be of the consistency where the gravy and the masala will nicely coat the potatoes. 9. When done, garnish with fresh coriander leaves, green chilies and lime wedges. 1. Boil the milk, stirring frequently, till it thickens. 2. Remember to stir from bottom of the pan since milk burns very easily. 3. Saute a handful of rice in a vessel containing 2 tsp ghee, bay leaves & a piece of black cardamom for 2 mins. 4. Add the mixture to the milk. 6. Then add the jaggery. 7. When the jaggery is properly mixed, sprinkle kishmish and broken cashew. Send Bengali New Year gifts to India through GiftstoIndia24x7.com and surprise your loved ones. Your Gift to India will be delivered right at the time of festivity in an undamaged condition.